If you are an owner of a small breed puppy, you probably agree that finding the best dog food for small breed puppies is a heck of a challenge. It is really so unless you have a decent feeding guide to help you. Look no further, because you’ve already found one. In this article, we will give you some useful tips on the best food for small breeds so your four-legged fluffy friend stays happy, healthy, and well-nourished. Healthy dog food for small dogs should only contain natural preservatives (or preferably none). Some artificial preservatives, such as Ethoxyquin, have been linked to bad health conditions in dogs such as allergic reactions, skin problems, cancer, and more. Even if it’s specifically puppy food for small breeds, avoid it if it has harmful preservatives. Puppy food labelled as “human-grade” is dog food manufactured according to the standards human food is manufactured. In other words, the ingredients used are safe for humans and the food was manufactured in a GMP-certified facility. While humans probably shouldn’t eat “human grade” dog food, having this stamp means it’s probably the best food for small dogs over food that doesn’t have it. Dogs are omnivores who favor meat, but still need other food groups to balance out their diets. Carbohydrates are important for dogs for the same reason they are important for humans – carbs equal energy. Dogs’ bodies also metabolize carbs for a source of heat. Whole grains are the healthiest carbs so make sure your small puppy’s food consists of mostly whole grains, not refined grains. Animal-based proteins are more valuable to a puppy’s health than plant-based proteins because they provide the correct amino acids puppies need to thrive. The healthiest small breed dog food has identifiable animal-protein sources such as chicken or beef as one of the first ingredients, even in dry puppy food. It canbe in the form of by-products which are perfectly acceptable. Unlike humans, puppies need a diet high in fats. Fats provide puppies with almost twice the energy as carbohydrates. 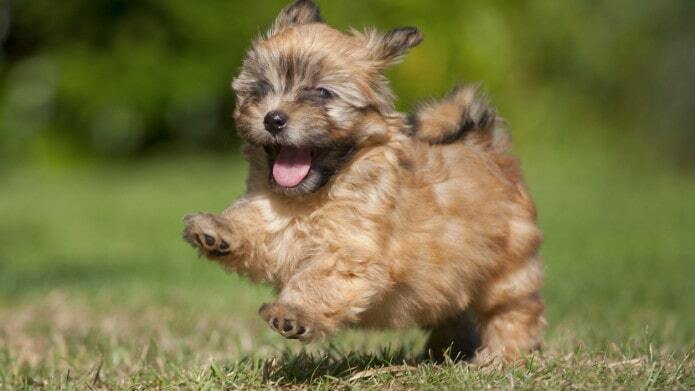 With small breed puppies, they need fats since their metabolic rate is higher than large breed dogs. The healthiest dog food for small dogs should have high-quality animal-fat or plant-fat sources listed in the ingredients list. Fats like lard or tallow, however, is not healthy for your puppy. Your puppy can eat certain fruits and vegetables. While fruits and vegetables aren’t the most important ingredients in your puppy’s food, many dog food advisors recommend choosing a puppy food that has fruit and vegetables listed as an ingredient. Fruit and vegetables provide antioxidants for your puppy and are an extra source of water, especially in hot weather. Your small breed puppy will get his/her amino acids in the form of animal fats. Out of the 22 amino acids your puppy needs, ten of them have to come from food. If your puppy is missing even one amino acid, none of them will work properly since they all work in a chain-reaction process. Ensuring the primary ingredient in your puppy’s food is meat will ensure your puppy gets all the amino acids he/she needs. If you’re wondering how long to feed your dog puppy food so they benefit from amino acids, don’t worry, because even adult dog food provides the amino acids your dog needs. Chelated minerals are minerals that are attached to an organic substance to make it easy for your puppy to digest. You can recognize a chelated mineral by its name. It will be the mineral followed by an organic compound that ends in -ate or -ide (ex. Zinc proteinate). A best small breed puppy food will have chelated minerals. Newborn puppies need to feed on their mother’s milk for the first month of their life which is the most nutritious puppy food at that time. After that, begin weaning them, giving them extra snacks until they are fully weaned. Here is where you will start using the best dog food for 3 month old puppies and up. The amount you feed your puppy may vary depending on the type and brand of food you feed him/her. 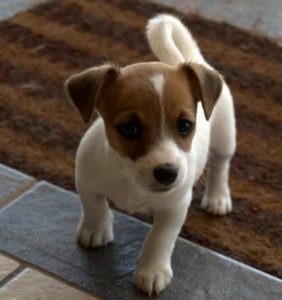 In general, you should feed your small breed puppy 3 to 4 times per day. For some small breeds, you could offer a light snack around 10pm. Small breed dogs often reach adult size by 9 to 10 months. At this time they can be slowly transitioned to adult dog food. It can be difficult as you try to compare various brands or formulas side-by-side, especially with manufacturers promoting so much packaging details. The question is, are they providing you solid data you’ll need for an educated purpose? These reviews not only touch on key features listed in the table, but they also highlight the benefits and potential issues that can affect your purchase. This formula focuses on improving five areas of small-breed health. Wellpet began distribution in 2008. Owners looking to supply their small-breed puppy with balanced nutrition and increased energy levels. Includes Barley, Oatmeal, and Oats. Chicken and Salmon animal proteins. Minerals listing includes cooper and iron. Verdict: A decently balanced kibble. Free-ranging and non-GMO ingredients are highlighted. Nutro has been expanding from local markets since 1976. An option for those needing holistic nutrition. Grains include Barley and Rice. Chicken and lamb proteins added. Verdict: A good choice for owners demanding natural ingredients for their puppy. This is a standard puppy kibble. Purina is part of the largest pet-food manufacturer in the world. Those needing easily available food for their puppy may consider this. Minerals include calcium and sulfur. Verdict: An easy-to-find alternative to other brands. A non-whole grain formula option. Diamond Pet Food has five U.S. manufacturing plants. Good for those seeking easy to digest protein sources. Uses roasted bison and venison. No whole grains are used. Minerals include copper, iron, and zinc. Verdict: An easily digestible kibble. A formula that veterinarians will recommend. Hill’s offers big discounts to U.S. pet shelters. Owners wanting to avoid artificial additives should appreciate this recipe. Uses whole Sorghum and Wheat. Makes use of chicken proteins. Minerals include calcium and sodium. Verdict: This vet recommended brand would be good for puppies that are suffering beef food allergies. This formula intentionally avoids the use of grains throughout. Natural balance was established in 1989 by a Hollywood actor. Pet-lovers wanting more control over proteins ingested could find this to their liking. This is a no-grain recipe. Duck meal proteins are added. Verdict: A low-ingredient list alternative. Iams’s formulas are known for their animal-based proteins. Paul Iams developed the first animal-protein dog kibble in 1950. Cost-conscious owners would appreciate this brand. Chicken meat is main protein. Has DL-Methionine and L-Lysine Monohydrochloride amino-acids. Minerals include copper and iron sources. Verdict: An option for pet owners who need a cheap selection. This formula showcases peas and potatoes over grains. General Mills bought out Blue Buffalo in 2018. Anyone searching for hi-fiber/hi-protein recipes should consider this. Includes chicken and turkey meals. Verdict: A non-grain chicken recipe. Made for easier digestion by your puppy. Royal Canin was established by a French veterinarian in the late 1960s. Sold as an easy to eat and absorb kibble. Minerals highlighted include calcium sources. Verdict: Great for small breed puppies. When shopping for healthy dog food brands for small dogs, customers repeatedly ask two important concerning eating habits. This includes why special products are needed for small breeds or younger canines. It’s important to make the proper selection in order to provide the nutrients these smaller pets need to grow as well as maintain proper health. Unfortunately, manufacturers don’t always cover why this is important. That’s why this article is written with actionable information. 1. Is it OK to give a puppy regular dog food? Puppy formulas are designed to provide nutrients that are critical for healthy development. Adult kibble often lacks nutrients younger canines use to grow normally. Small dog formulas are beneficial to breeds that weigh less than 20-pounds when they’re adults. These products cater to smaller canines that will mature more quickly than their larger counterparts. 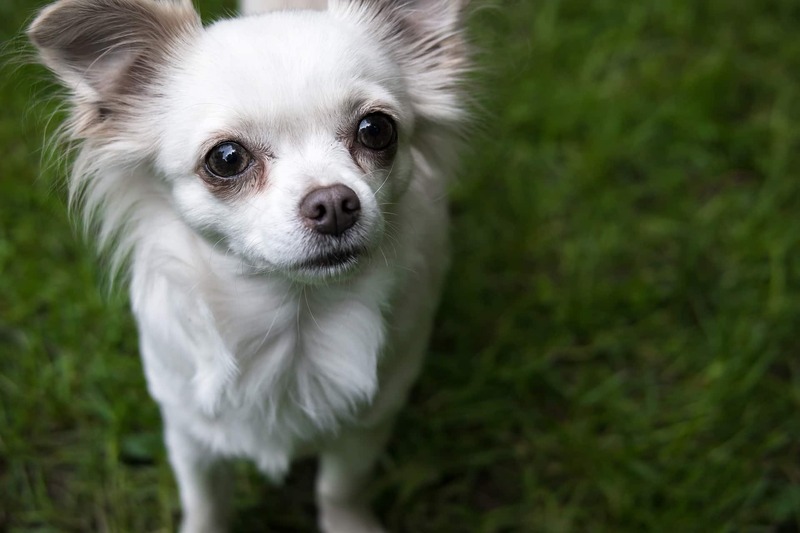 Little dogs can grow to maturity in nine months, while large breeds can take more than twice as long. Look for products combining both. 2. Do small breed dogs need small breed food? Metabolism considerations – Smaller canines often have higher metabolisms that will require more energy-rich foods to meet their needs. Weight issues – Smaller pets can potentially gain weight more quickly than larger animals. Recipes made for your little companion will pack more energy promoting nutrients within the kibble. That will allow them to get the most benefit from smaller portions. 3. 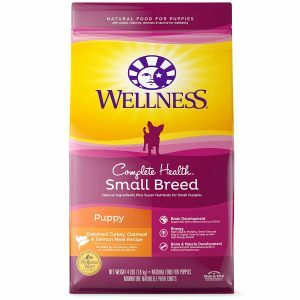 What puppy food for small breed is the best? 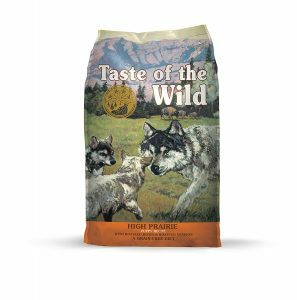 After comparing these products, we feel that Taste of the Wild Grain Free High Protein is the best dog food for small breed puppies. This formula is easy to eat and digest while providing the nutrients that your puppy needs. Small Breed Puppy Turkey, Salmon & Oatmeal – Suggestible for something different. 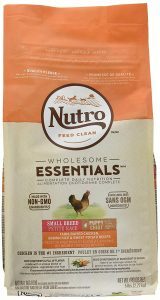 Nutro WHOLESOME ESSENTIALS Puppy Dry Dog Food – Recommended to natural shoppers. 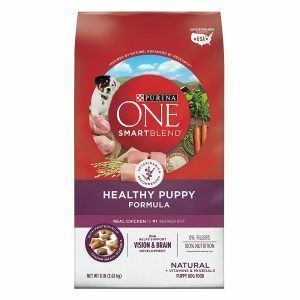 Purina ONE SmartBlend – Suggested for a generic go-between. 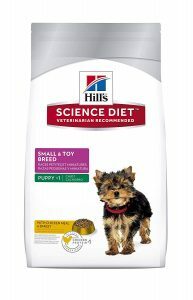 Hill’s Science Diet Small – Suggested by many vets. 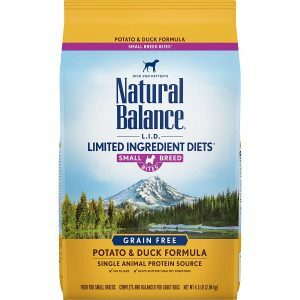 Natural Balance Limited Ingredient – grain free – Recommended for protein control. Nutro WHOLESOME ESSENTIALS Puppy Dry Dog Food – Suggested for non-GMO shoppers. 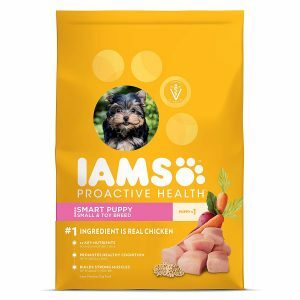 Iams Proactive Health Puppy – Recommended only if you can’t find the others. 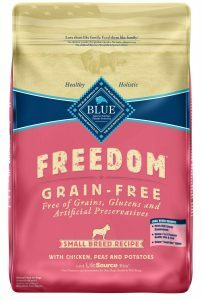 Blue Buffalo Freedom Grain Free Recipe for Dog – Suggested as a beef alternative. 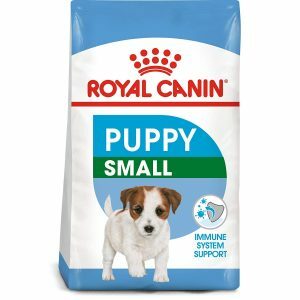 Royal Canin Size Health Nutrition Mini Puppy Dry Dog Food – Recommended to small breed owners. Petstiger.com is a participant in the Amazon Services LLC Associates Program, an affiliate advertising program designed to provide a means for sites to earn advertising fees by advertising and linking to Amazon.com. Additionally, Petstiger.com participates in various other affiliate programs, and we sometimes get a commission through purchases made through our links.